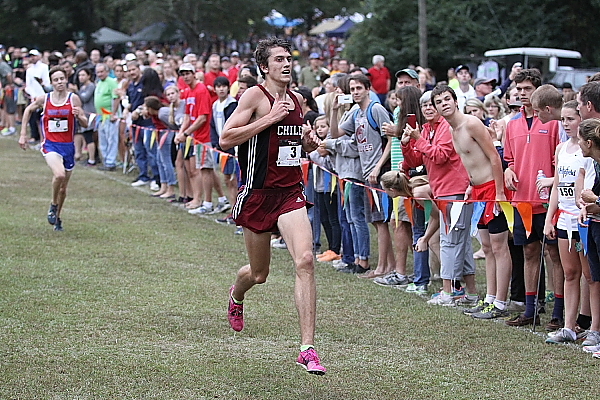 That's Chiles HS stud Avery Bartlett holding off a late charge by Walton's Mitchell Sanders. After a little 'double chip action' snafu (NO fault of the Timer folks) things were sorted out for the teams from 2nd to 6th) but it didn't affect Chiles HS senior laden squad (FL) as they just wore out a tough field winning by 70 points over Walton (104) Sweeping 3 of the top 4 spots was the ticket for Chiles as Avery Bartlett began the onslaught nipping Walton's Mitchell Sanders the final few meters in 15:55 Sanders (15:56) Tyson Murray crossed 3rd for Chiles at 15:58 and Allen Hernandez was 4th in 16:01. Woodstock's Bailey Owen ran tough getting 5th Overall posting a 16:01 while North Oconee's Tyler Jones was 6th in 16:07. 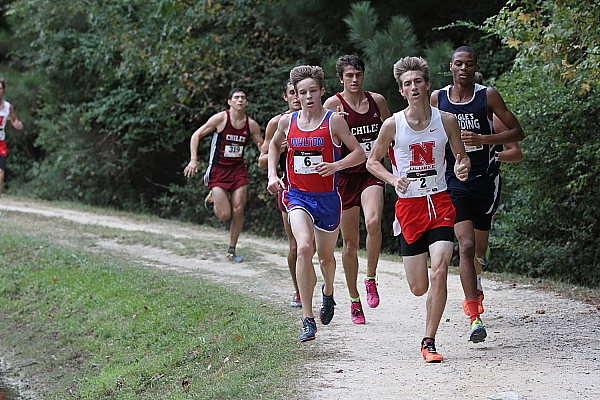 Devin Dixon of Eagle's Landing HS had a big pr at 16:10 good for 7th. Woodward Academy was a strong 3rd led by sr Alex Murfee's 10th place 16:15. Westminster's boys may have began their drive for a state title going head to head with Blessed Trinity (3A) winning by 23 points bringing them back in contention for a state title. North Oconee placed 5th with only 5? finishers.. If only Marist wasn't in class 4A, Heritage-Catoosa (pictured above) would be the team to beat. But, winning the Atlanta Classic was just huge for the Lady Generals defeating strong programs the likes of Walton, Westminster, Chiles, St.Pius X and Landmark Christian. They also did it without a top 10 Overall finisher relying on a tighter pack after top scorer Emily Poole in 11th at 19:27 and Caitlin Craft placing 14th in 19:51. 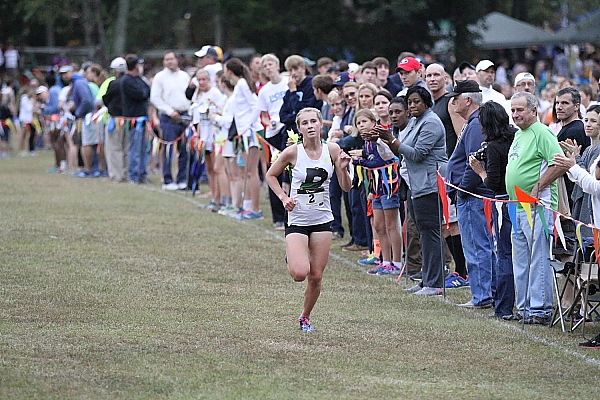 Jr Mary Grace Strozier (pictured above)repped Pelham (AL) winning the Girls Individual title in a swift 18:08 defeating a few of Georgia's best female runners. Walton's Avery Bussjager (pictured above) was steady overtaking a few girls the 2nd half of the race seizing 2nd in 18:30 leading the Raiders to 3rd place team finish. Has the 'Sleeper' awakened in 3A now? It appears so, as Westminster was a close 2nd 10 points behind Heritage-Catoosa. 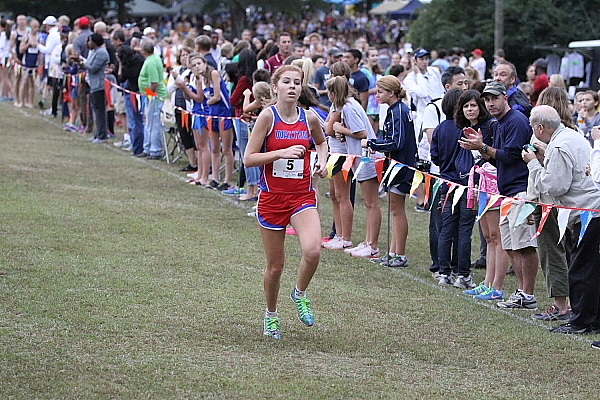 Frosh Delaney Graham was the 'top Cat' placing 7th in 19:09. Too bad Blessed Trinity's girls didn't go heads up like their boys did against Westminster...Chiles placed 4th as a team followed by St.Pius X and Landmark Christian. 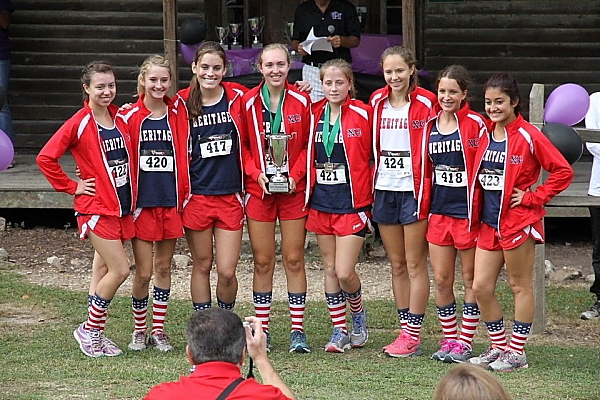 Rounding out the top 5 overall were soph Nicole Fegans (18:37) Kathryn Foreman (18:42) and Ashley Kehoe (18:54).